Hedley Burr | Tommy's Footprints…..
Stanley Burr came from the village of Holwell which is a couple of miles north of Hitchin. He was one of seven children. Each of the six Burr boys served in WWI, three of them with the Bedfords. 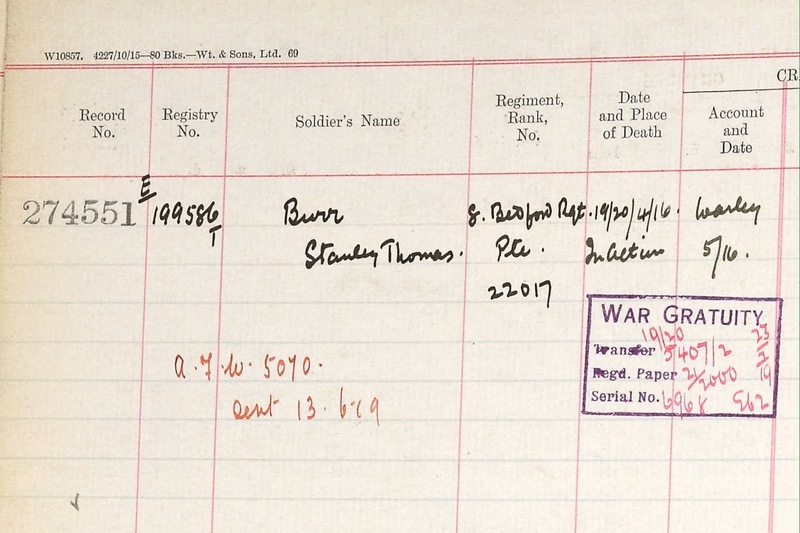 Stanley (22017) and his younger brother Hedley (22013) both enlisted at Bedford, probably on the same day. The boys trained at the Bedfordshire Training Depot and were drafted to reinforce the Bedfords’ 8th Battalion at the Front. On April 15, 1916 at Ypres the company took their turn in the trenches of Yser Canal Bank between bridges No.2 and 4 – map. On the night of 19/20 April, after 2 hours of heavy bombardment, the German infantry attacked with bomb and bayonet, and gained a footing in the British front-line trenches. The Bedfords resisted but sustained heavy casualties and lost ground. The two brothers were reported as ‘missing.’ With all six sons serving with the British Army their parents George and Sarah’s wait for news doesn’t bear thinking about. Records show that at least twenty-one Ampthill Park recruits were killed at Ypres that night. Stanley Burr (20) was one of them – he has no known grave. Stanley is remembered on the Ypres Menin Gate Memorial where 40,500 British soldiers are named. Hedley Burr survived the action but little is known about what happened to him. Hedley (21) died on 14 November 2018 a few days after the Armistice. He is buried in Cologne. The timing and location of Hedley’s death suggest he was a prisoner-of-war. Four of the brothers – Herbert, Arthur, Sidney, and Alfred Burr – survived the Great War. Stanley and Hedley Burr are remembered in St.Peter’s Church, Holwell and on the Duke of Bedford War Memorial in Ampthill Great Park. This entry was posted in Soldier Stories, Uncategorized and tagged 1914-18, 8th Battalion, Ampthill, Ampthill Park, Bedfordshire Regiment, Bedfordshire Standard, Bedfordshire Training Depot, Centenary, Great War, Hedley Burr, Holwell, Menin Gate, Stanley Burr, War Memorial, WWI, Ypres, Yser Canal on May 27, 2016 by Ste H.